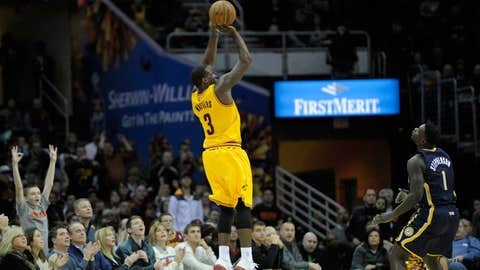 Shooting guard Dion Waiters had 14 points for the Cavaliers in Sunday night's loss to the Pacers. CLEVELAND — It was supposed to be an exciting season filled with promise and some pretty cool results. But those are descriptions that don’t yet fit the Cavaliers, and we’re almost at the midway point. Following an 82-78 home loss to the Indiana Pacers on Sunday, the Cavs are 11-23. That’s three more wins than at this point last season. That’s probably not what the Cavs were shooting for. Worse, the Cavs aren’t really playing like a team with a clear identity. Now, in fairness, they’ve been without star point guard Kyrie Irving (bruised knee) for three straight games. They were also without Irving’s replacement in the starting lineup, Jarrett Jack (back spasms), on Sunday. That’s a lot to overcome against the Pacers (27-6), considered by some to be the league’s best and most cohesive team. And man oh man, the Cavs played hard. Dion Waiters got especially hot in the fourth quarter, when he scored 12 of his 14 points. It helped cut a deficit that once reached 16 points to just one. It was the type of one-man show we haven’t seen in Cleveland since… well, Irving. But these rallies aren’t an identity. They’re just stretches of good defense, or in the case of Waiters, just a guy catching fire. So the Cavs remain a team that usually tries its darndest to win, but still has little idea how to get there. The Cavs are not a mess. They’re just not in a place of basketball peace and tranquility. They’re just not who we thought they were. 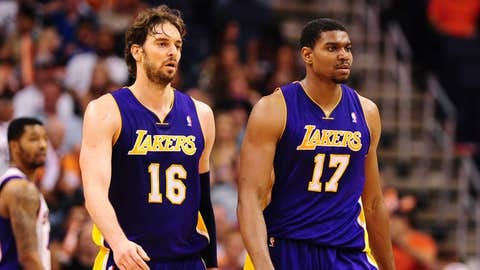 With trade rumors swirling around the Cavs as they tried to shed Andrew Bynum and his contract, the guys on the floor blocked everything out and played their buns off. The 17,502 in attendance showed their appreciation by standing up, stomping their feet and making some noise. If there’s one thing you can say about this team, it’s that the fans offer undying support on a game-by-game basis. It is the bigger picture that is often concerning. The Cavs are 2-15 on the road with a five-game Western Conference swing right around the corner. They’ve won two of their previous 12 overall — and the two came at home, over Orlando (bad) and Milwaukee (even worse). That’s not exactly a glowing resume, kids. With or without Irving, with or without Bynum, with or without Waiters and the rest … Cavs coach Mike Brown just haven’t figured out a way to put it all together. "I though in the second half, especially as the game went along, all of our guys stepped up their level of intensity and grittiness," Brown said of Sunday’s loss. "We were getting stop after stop. We were moving the basketball, spacing the floor and setting solid screens." Without question, it resulted in some good things. C.J. Miles scored a team-high 21 points. Anderson Varejao grabbed a game-high 13 rebounds. Tristan Thompson offered another underrated showing with 13 points and 10 boards. And, of course, Dellavedova got under the opponent’s skin. That included no less than Pacers star forward Paul George (16 points) — who seemed truly annoyed when he said the Cavs rookie guard "was doing too much." Yet all are things that don’t happen nearly enough. Otherwise, the Cavs wouldn’t be in this position. Well, we’ve been over this before. Only Brown and the Cavs have the answers. At some point, and soon, it has to be more than effort and stringing together moments of good ball movement and defense. There needs to be some consistency. There needs to be an identity.